If you've never been fearless, find out how you can be tonight by hanging around some valley girls who know where it's at. Girls on the Run Wood River Valley will host an evening of videos, films and speakers by, for, and about women as part of the annual Lunafest on March 9 starting at 5 p.m. at the nexStage Theatre. Girls on the Run is a valleywide healthy lifestyle program for preteen girls that emphasizes positive emotional, social, mental, spiritual and physical development. Through an interactive curriculum, girls learn self-respect and confidence tools in the hope that with this foundation they can steer clear of the traditional pitfalls of growing girls. Each season is capped with a 5k fun run in spring and fall. New this year is the addition of Kidtubefest, a selection of funny and inspirational YouTube videos, one of which was made by local kids to launch the idea of local video submittals for next year. A silent auction, open for bids now and until Tuesday, March 13, includes a North Valley Trails pass, Sun Valley Center for the Arts Summer Concert series tickets, Zenergy membership and a private party at Whiskey Jacques'. For a complete list, visit www.lunafestauction.org. Girls on the Run sponsors an annual essay contest that invites girls to explain how being a part of the organization makes them fearless. This year's winner is Sophia Sturgeon from Hemingway Elementary School, who will read her essay to the crowd tonight at 7 p.m., kicking off the short film series. - "How to be Alone": Filmmaker Andrea Dorfman and spoken-word artist Tanya Davis use music, poetry and whimsical animated images to explore the state of being alone. - "Lady Razorbacks": When a group of Pacific Islander women start a rugby team in East Palo Alto, Calif., this diverse group of women, which includes teenagers struggling with school, church-going college students and mothers of six, find an unexpected sanctuary on the field. - "I Am a Girl": Every 13-year-old girl dreams of that nice-but-hard-to-get boy, and Joppe is no different. She consults her friend on how to ask Brian out, but how can she tell him that she was born a boy? 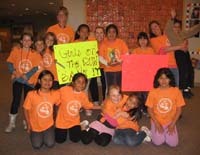 For a complete listing, visit www.girlsontherunwrv.org. “Girls on the Run did not just make me do sports. It made me fearless about my school work and my social life.” Hemingway Elementary’s Sophia Sturgeon in her essay on the impact of Girls on the Run. Click here to read the complete version. What: Short films by, for, about women. 5 p.m. Free Kidtube fest showing inspirational films for young people by local youth. 6 p.m. Silent auction to raise money for Girls on the Run of the Wood River Valley and the Breast Cancer Fund. Preview bidding for trips, snowshoe and ski pass packages at www.lunafestauction.org. 7 p.m. Showing of Lunafest films. Special honor: Sophia Sturgeon, Hemingway Elementary School fourth-grader will read her winning essay on "How Girls on the Run has made me fearless." Tickets: In advance at all Sturtevants, Chapter One Bookstore and online at www.girlsontherunwrv.org. Students and seniors $10, adults $15, $20 at the door. Info: Mary Fauth, mary@girlsontherunwrv.org or 788-7863.